For lists of camps and information on internment actions by country, see List of concentration and internment camps. 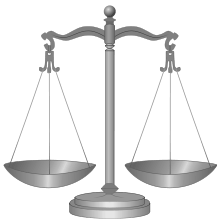 Internment is the imprisonment or confinement of people, commonly in large groups, without trial. The term is especially used for the confinement "of enemy citizens in wartime or of terrorism suspects". Thus, while it can simply mean imprisonment, it tends to refer to preventive confinement, rather than confinement after having been convicted of some crime. Use of these terms is subject to debate and political sensitivities. Interned persons may be held at prisons or at facilities known as internment camps. In certain contexts, these may also be known either officially or pejoratively, as concentration camps. Internment also refers to the practice of neutral countries in time of war in detaining belligerent armed forces and equipment in their territories under the Hague Convention of 1907. 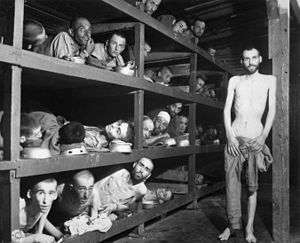 History of internment and the term "Concentration camp"
Jewish slave laborers in the Buchenwald concentration camp near Weimar, 16 April 1945. Second row, seventh from left is Elie Wiesel. The American Heritage Dictionary defines the term concentration camp as: "A camp where persons are confined, usually without hearings and typically under harsh conditions, often as a result of their membership in a group the government has identified as suspect." The Polish historian Władysław Konopczyński used the term concentration camps when describing events in Poland during the Bar Confederation rebellion (1768–72), when the Russian Empire established three prison camps for Polish captives awaiting deportation to Siberia. The United States set up concentration camps for Cherokee and other Native Americans in the 1830s. In 1864, the U.S. government forced 8,000 Navajos to walk more than 300 miles at gunpoint from their ancestral homelands in northeastern Arizona and northwestern New Mexico to an internment camp in Bosque Redondo, a desolate tract on the Pecos River in eastern New Mexico. From 1863 to 1868, the U.S. Military persecuted and imprisoned 9,500 Navajo and 500 Mescalero Apache. Living under armed guards, more than 3,500 Navajo and Mescalero Apache men, women, and children died from starvation and disease. The English term originated in the reconcentrados (reconcentration camps) set up by the Spanish military in Cuba during the Ten Years' War (1868–78), Cuban War for Independence (1895–98), and by the United States during the Philippine–American War (1899–1902). The term concentration camp saw wider use during the Second Boer War (1899–1902), when the British operated such camps in South Africa for interning Boers. They built 45 tented camps for Boer internees and 64 for black Africans. Of the 28,000 Boer men captured as prisoners of war, the British sent 25,630 overseas. 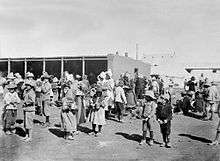 The vast majority of Boers remaining in the local camps were women and children, over 26,000 of whom died there. 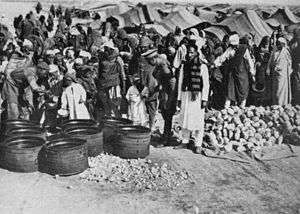 Between 1904 and 1908, the Imperial German Army operated concentration camps including the Shark Island Concentration Camp in German South-West Africa (now Namibia) as part of its genocide of the Herero and Namaqua peoples. In the late 1930s, over 100,000 defeated or interned personnel of the Spanish Republican armed forces, along with civilians, were held in concentration camps by the government of France, including Meheri Zabbens, and the Camp de concentration d'Argelès-sur-Mer in southern France. Some of them managed to go into exile or went off to join the armies of the Allies in order to fight against the Axis powers, while others ended up in Nazi concentration camps. During the 20th century, the arbitrary internment of civilians by the state reached its most notorious excesses with the Nazi concentration camps (1933–45). The Nazi concentration camp system was notable for its extensive size, with as many as 15,000 camps and at least 715,000 simultaneous internees. The total number of combined casualties in these camps is difficult to tabulate, but the conscious policy of extermination through labor in at least some of the camps ensured that inmates would die of starvation, untreated disease and summary executions. Moreover, Nazi Germany established six extermination camps, specifically designed to kill millions, primarily by gassing. As a result, some say that the term "concentration camp" today may be conflated with the concept of "extermination camp" and historians debate whether the term "concentration camp" or "internment camp" should be used to describe other examples of civilian internment, such as the United States' internment of Japanese Americans during World War II. ↑ "The Second Hague Convention, 1907". Yale.edu. Retrieved 1 February 2013. ↑ "Concentration camp". American Heritage Dictionary. Retrieved 22 July 2014. ↑ Konopczyński, Władysław. (1991), Konfederacja barska, t. II, pp. 733–734. 1 2 "Concentration Camp". The Columbia Encyclopedia (Sixth ed.). Columbia University Press. 2008. 1 2 Meredith, Martin (2007). Diamonds, Gold, and War: The British, the Boers, and the Making of South Africa (First ed.). New York: PublicAffairs. pp. 452–456. ISBN 978-1586484736. ↑ Knight, Ian (2000). Boer Wars (2): 1898–1902. Men-at-Arms. Oxford: Osprey Publishing. p. 40. ISBN 978-1855326132. ↑ Concentration Camp Listing Sourced from Van Eck, Ludo Le livre des Camps. Belgium: Editions Kritak; and Gilbert, Martin Atlas of the Holocaust. New York: William Morrow 1993 ISBN 0-688-12364-3. In this on-line site are the names of 149 camps and 814 subcamps, organized by country. ↑ Evans, Richard J. (2005). The Third Reich in Power. New York: Penguin Group. ISBN 978-0-14-303790-3. ↑ Marek Przybyszewski, IBH Opracowania - Działdowo jako centrum administracyjne ziemi sasińskiej (Działdowo as centre of local administration). Internet Archive, 22 October 2010. ↑ Robert Gellately; Nathan Stoltzfus (2001). Social Outsiders in Nazi Germany. Princeton University Press. p. 216. ISBN 978-0-691-08684-2.